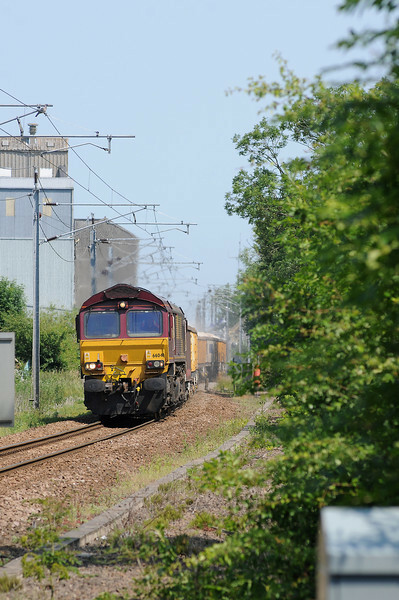 There wasn't much freight action in my part of East Anglia on Saturday courtesy of Network Rail's work on the Ely Dock Junction to Soham line, but DBS were in action on the Middleton Towers to Warrington Arpley sand train, a welcome addition to the King's Lynn scene on a Saturday. 66041 is leaving the loop at Downham Market. Behind are the grain silos of Heygates, which were once rail connected and which benefited from investment in the 1970s only for it all to be blown away when the Speedlink Network collapsed in 1991.